Against all probability, yesterday’s post completes the fourth full year of daily death-blogging here since Executed Today launched on Halloween 2007. That’s 1,461 straight days, including a February 29. It’s also a couple of trips overseas, a long move, a random hospitalization, and whatever else it is that comprises a life. Back when I first started toying with this concept, I told people who asked where the material came from that the annals held such a vast forest of heads on pikes that if the blog didn’t go for 3-5 years it would only be for want of its writer’s energy. The sentiment was a means of setting a bar for myself. Short of three to five years, the project would have been ill-done, relative to my vision for it, no matter how compelling the reason to abandon it. Though it’s absurd in a site that’s all about endings, I have to admit that I never thought about what winding down would look like — what comes after three to five years, and when. I wouldn’t bet on that longevity … but then, I wouldn’t have bet on actually making it this long in the first place. As always, I depend heavily on guest contributors, enumerated in detail below. But special gratitude is due (and regularly experienced) to Meaghan Good of the Charley Project. For reasons best known to herself, Meaghan “adopted” this site sometime after she discovered it and has been an absolutely prolific contributor — all while maintaining a vast and important site of her own on missing persons in the U.S. By my count, Meaghan has squeezed in time for 32 posts in the past 15 months, and that’s not counting those that are queued up for the months ahead. She’s got a nose for a great story, a knack for retelling it, and an unnatural level of patience for my scatterbrained harried-editor act. She’s been the margin between a night’s sleep and a total constitutional collapse so often that it’s fair to say she’s been the margin that has enabled Executed Today to keep up its run at all. I like to think it’s a discerning crowd that hangs about for what, after all, is an exceedingly niche subject with no marketing muscle. Exponential growth is fun while it lasts, but if you ever catch me complaining that my audience is too small, please slap some sense into me. I’m thrilled that so many people so regularly stop by to visit. Not a whole lot of news in this department relative to previous years — excluding the searches on “executed today” and “executedtoday”, the top 10 searches (and the top 50, and the top 100 …) are overwhelmingly the names of executed individual men and (especially) women. The Twitter feed has more than doubled to about 1,100 followers, who have endured 7,200 tweets. The most popular posts on Executed Today have a familiar look about them. And it’s not just the accumulation of preceding years’ traffic stats; most of the top posts on this list are also among the top posts week in and week out. Home of a thousands-long comment thread on everything Bundy, this one post has been viewed nearly 100,000 times on its own — more than numbers two through four on this list combined. Overthrown Liberian dictator tortured to death as the cameras rolled. The Tudor politician is the only fellow from before the 20th century among the site’s top 40 posts. The former Soviet-backed Afghan ruler hanged from a traffic pylon by the Taliban has been the year’s biggest mover: it was merely #35 as of last October, but it’s been second-most-trafficked (behind only Bundy) during the past year. The only top-50 executee to be portrayed on celluloid by Tom Cruise. This site is basically sponsored by World War II. 34. February 17, 2004: Cameron Todd Willingham We beat the national media to the news that Rick Perry executed an innocent man, but the national media has had its revenge by filing enough Willingham stories to bury this link. That’s okay: we’ll take it. The most-trafficked post actually put up since last Halloween is that of Eva Dugan, a grisly botch in Canada — which is #123 all-time and stands a good chance at cracking the top 50 by this time next year. 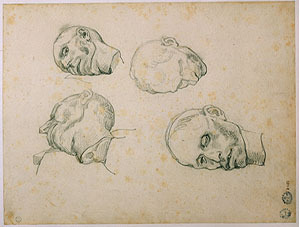 Four studies of the severed head of a man, by Theodore Gericault. This blog gets by with a little help from its friends; close to 10% of the content has been written by guest authors. Other than guest posts, which are always among the best content on the site, these are a few of the everyday posts that I found most interesting to write. Nov. 4, 1778: Abraham Carlisle and John Roberts, triggering Benedict Arnold’s betrayal? Jan. 22, 1952: Yosef Basri and Shalom Salah, Jewish bombers? Awesome work! I teach astronomy and find I keep coming back here for posts on Giordano Bruno and Katarina Kepler (not executed thanks to her son, Johannes). My students are fascinated by this site, so hopefully I’ve been driving some traffic here. Now I’ll just subscribe and enjoy all your hard work. THANK YOU!! Not only is that a lot of writing but an awful lt of dedication! Congratulations. I ended up here a couple of years ago while doing an image search for Lucius Sergius Catilina and haven’t missed a day since.